John Billiot said in his 13 years of responding to hurricanes, Hurricane Michael was the worst he has ever seen. The Scott native is the president of America's Cajun Navy. The group of several hundred volunteers provides search-and-rescue efforts during and after storms, using their own private boats, vehicles and equipment. 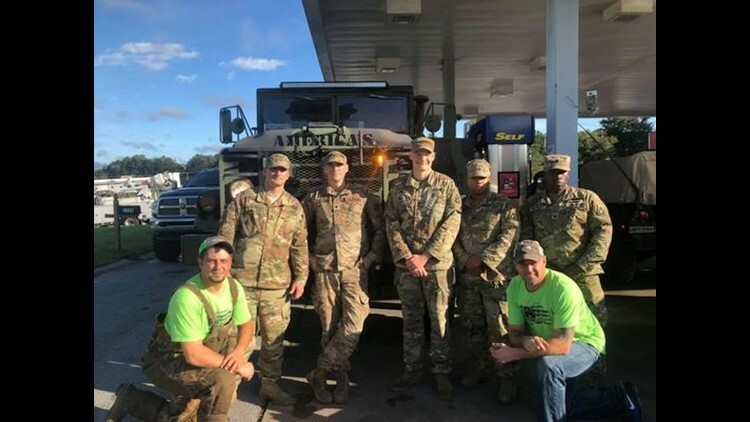 They traveled to Panama City, Florida, this week to help respond to Michael. They ended up riding out the storm of a lifetime in a local hotel. "It put the fear of God in me," Billiot said. "This is the first time I was ever scared. This was a totally different situation here." Cajun Navy members, which include America's Cajun Navy, received national and international attention for their rescue efforts during Hurricane Katrina. They have since responded to numerous disasters including the 2016 Louisiana floods, hurricanes Harvey and Irma, the 2018 Hidalgo County flood, Hurricane Florence and Tropical Storm Gordon. Billiot said he and about 30 members of the team left Lafayette Tuesday morning and arrived in Panama City that evening. They set up a staging area at a local Holiday Inn and immediately started helping to evacuate people. As conditions deteriorated, with torrential rain and winds already reaching 100 mph, the team responded to calls from people who had no way to flee the storm. "Many people didn't leave because they had no way to leave," he said. "They don't have vehicles or they are elderly on oxygen." Billiot finally halted the mission when the team crossed a bridge and encountered 100 to 120 mph winds that threatened to topple the five-ton military vehicle he was driving. Once back at the hotel, they experienced a night of harrowing proportions. For several hours, as Michael made landfall, the men and hotel guests were surrounded by the sounds of smashing glass and walls being torn from the building that was their shelter. "People were screaming and hollering everywhere," Billiot recalled. "It was horrible. There was a 2-month-old baby that got all cut up from the shattering glass." Outside, it was total chaos. Billiot saw palm trees bending and pine trees snapping like tooth picks. Transformers were hitting the ground and smashing to pieces. Several of the Cajun Navy's vehicles were damaged by flying debris. Billiot's truck was flooded and his windows had been smashed. When the winds died down to about 80 mph, the team took some of the injured people and the child to a nearby emergency room. They then went out to clear roadways and help anyone they could. "There were trees, buildings in the road, we drug them out of the way to make the road passable so we could find people. We found people locked in bathrooms, stuck in the floods, (places) like that." Billiot estimated the crew was able to rescue more than 100 people in just the three days he was there. He has since returned to Scott to fix his damaged vehicles, but plans to go back and join the other members in the next few days. He said the ordeal has taken a toll on him and his family. "My son was crying saying, he was worried like, 'Daddy, why did you go there?'" Billiot said. "But we aren't going to leave there until we've done a full-grid search on every single part of the city that has been hit."